If You Had a Time Machine Would You Kill Hitler or Bring This Boarding Pass Back to 1989? 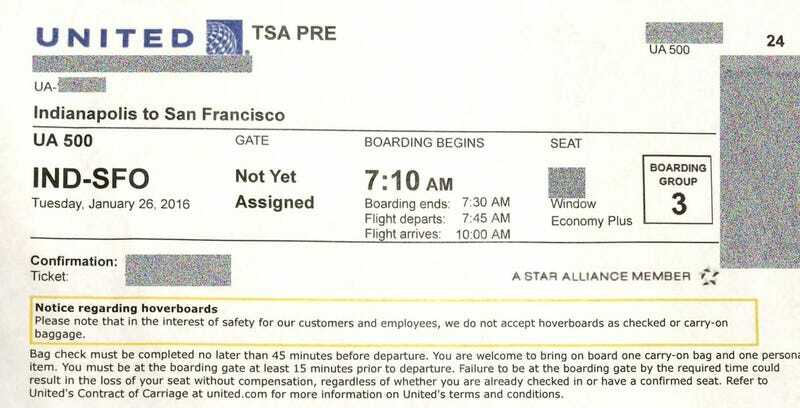 If you ever get a chance to travel back in time to the year 1989 (the year Back to the Future: Part II was released) make sure you bring a United Airlines boarding pass. People will be so excited to see that their dreams of one day owning a hoverboard will come true. Notice regarding hoverboards: Please note that in the interest of safety for our customers and employees, we do not accept hoverboards as checked or carry-on baggage. Virtually every airline has been banning hoverboards since early December. But there’s something about seeing that word “hoverboard” on an official document that stings just a little bit. We thought we were going to get those hoverboards that Marty McFly zips around on to defeat Griff Tannena and his fellow baddies. Instead, we got a Segway without handlebars. Here at Gizmodo, we’ve officially surrendered to the term “hoverboard” as synonymous with “two-wheeled self-balancing scooter.” But people from the past who grew up with the word from the Back to the Future trilogy just can’t seem to let it go. In fact, they get downright angry. My inbox and comments sections are filled with people who swear they won’t surrender to calling them hoverboards. But just because your jimmies got rustled doesn’t mean that you can control the ebb and flow of the national lexicon. And the people have decided; United Airlines have decided — they’re called hoverboards. In retrospect, this joke from a politician back in 2014 was spot on. Washington, D.C. councilwoman Mary Cheh proposed that the 2015 city budget include hoverboard lanes. If only she had known that here in 2016 that wouldn’t be such a silly thing to say.